Olympus’ X-ray fluorescence (XRF) analyzers provide high-performance, real-time geochemical data for rapid multielement characterization of soil, rocks, and ores. Recent advances in XRF technology have increased the number of elements measured, improved the limits of detection, and reduced analysis test times. 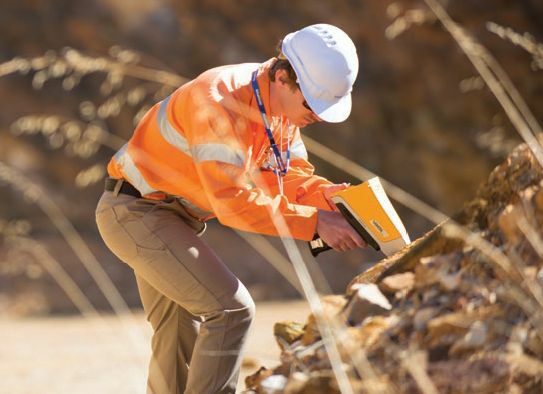 Vanta™ XRF analyzers provide convenient and rapid measurement of many types of samples associated with Au exploration, within Au mines, Au mine labs, and refined Au products. Most Au deposits have an associated geochemical signature (as shown in the table above). 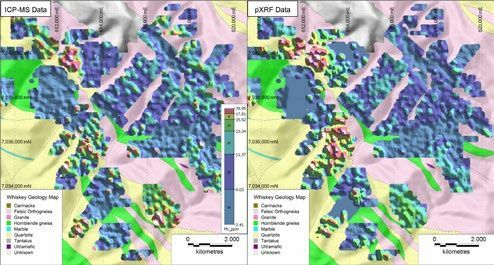 The XRF analyzer can detect these geochemical signatures, enabling geologists to better understand the geological system in which they are working. Typical Au pathfinder elements include As, Cu, Pb, Zn, Sb, Bi, Ag, and W.
It is common knowledge that handheld XRF analyzers do not support direct low level measurement of Au in geological samples (e.g., low ppm and ppb). The lab-based fire assay technique is commonly recognized as the method of choice for Au analysis. Au L-level X-ray lines are located in a very crowded area of the X-ray fluorescence energy spectrum. In this part of the spectrum, interference from other elements (e.g., As, Zn, W, and Se) can yield a false-positive Au determination. Direct measurement of Au by XRF can be achieved in specific cases such as high-grade (> 5 ppm) quartz vein environments (relatively interference free) or within refined Au products (where Au is present in very high concentrations). An increasing number of Au onsite mining laboratories are using XRF in place of, and as a supplement to, fire assays methods. Please refer to the Olympus Application Note “Use of Handheld XRF in Au Mine Laboratories.” Mines are also using Olympus handheld XRF analyzers for measuring Au in activated carbon. Please refer to the Olympus application note, "Measuring Gold in Activated Carbon." Images taken from: Arne et al. 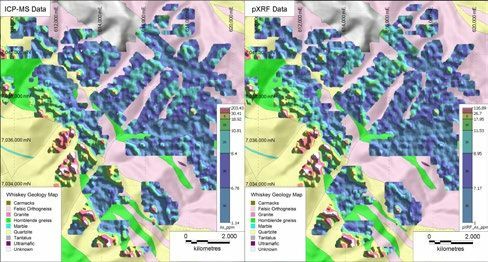 (2014) – The use of property-scale pXRF data in gold exploration – advantages and limitations, Geochemistry: Exploration, Environment, Analysis. 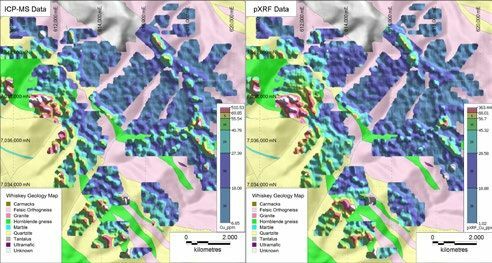 Contor plots of As, Cu, and Pb in surface soil using field XRF compared with ICP analysis from Au exploration project in Canada. Vanta handheld XRF analyzers for mining and geochemistry provide immediate on-site elemental analysis for geochemical exploration, mining grade control, ore processing, and remediation.